Foiling Services provide decorative foiling and laminating services to a variety of markets and industries. We apply decorative and functional hot transfer foils, PVC films, protection films and self adhesive tapes to a range of plastic, metal and wood based sheet materials. We are able to foil profiles in addition to sheet and reel material. 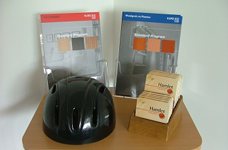 We laminate or foil various materials including Plywood, MDF, PVC, ABS, HIPS, ASA, Acrylic and Aluminium. This covers a range of thicknesses from 200 microns to 30mm, widths up to 1280mm and lengths up to 3000mm dependant on the product specification. We use well respected manufacturers for our finishes, such as Leonhard Kurz, Renolit, Novacel and Poli-Film. The extensive range of exterior and interior grade foils, and films are limited only by your imagination, but include uni-colours, woodgrain, marble, granite, metalized, holographic, transparent and brushed effects. The decorated sheets are used for a wide range of applications including point of sale displays, composite doors, infill panels, wall cladding, building products, decor panels, industrial mouldings, engraving and sign making materials. These products can be processed by vacuum forming, drape moulding, line bending, die cutting or general fabrication depending on the substrate and foiling combination being suitable.